Your wood siding and trim requires painting and maintenance to protect its beauty. At Pinpoint Paining we use the highest quality paints and stains to give you a maximum return on your painting investment. We do not have a “One Size Fits All” approach to painting wood structures. 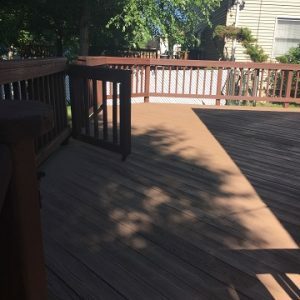 Depending on the condition of your wood and the previous coatings, we will select the appropriate primer and topcoat that gives your home or commercial space a leg-up on a long-lasting finish. All of our recommendations are backed by our management team’s 50+ years combined experience working in the painting industry. What is the difference between a paint and a stain? Also known as “House Paints,” these coatings are designed to go on nearly all vertical surfaces on your home. They are designed to protect your wood from natures elements. House paints are thicker than stains and have more adhesion so the coating can stick, or “bite” the surface. Although similar in many ways to house paints, exterior stains are thinner in viscosity than paints. Stains are designed to penetrate, or “soak in” to the wood. Stains are often used on T-111 siding and other porous woods for maximum effect. We use high quality primers to seal in the wood grain and provide a solid foundation for the topcoat. Certain woods that are oilier than others, such as cedar in redwood which requires oil-based primers to seal in the natural oils or “tannins.” We will explain to you the different options at the time of your estimate, as they will be dependent upon the condition and type of wood. To schedule an appointment call us or complete the form to the right.